Obesity, defined as a body mass index (BMI) >30.0 kg/m 2 , is a major public health problem today. The prevalence of obesity has increased substantially over the past decades in most industrialized countries. Obesity is a risk factor for several chronic diseases, most notably hypertension, type 2 diabetes, dyslipidemia and coronary heart disease. ,, Since adiposity can be considered a systemic disease that predisposes to a variety of comorbidities and complications that affect overall health, obese persons and all health professionals including dentists should require awareness regarding obesity. Further, recent studies have suggested that obesity is also associated with oral diseases, particularly periodontitis. ,,,,, In fact, the adipose tissue secretes several cytokines and hormones that are involved in inflammatory processes, suggesting that similar pathways are involved in the pathophysiology of obesity and periodontitis. The definition of obesity is based on body mass index (BMI, also called Quetelet Index), which is the ratio of body weight (in kg) to body height (in m) squared. BMI is highly correlated with fat mass and morbidity and mortality and therefore sufficiently reflects obesity-related disease risk in a wide range of populations; however, there are some limitations. For example, for the same BMI, older persons tend to have a higher body fat composition; and therefore, risk assessment by BMI is less accurate in older people (over 65 years of age). Body fat distribution is assessed by the measurement of waist circumference, with 102 cm in men and 88 cm in women, respectively, being the cut-off point for abdominal obesity associated with an increased risk of morbidity. Waist circumference shows a close correlation with the amount of visceral adipose tissue, and visceral adipose tissue has been shown to be metabolically more active and to secrete far greater amounts of cytokines and hormones compared with subcutaneous adipose tissue. 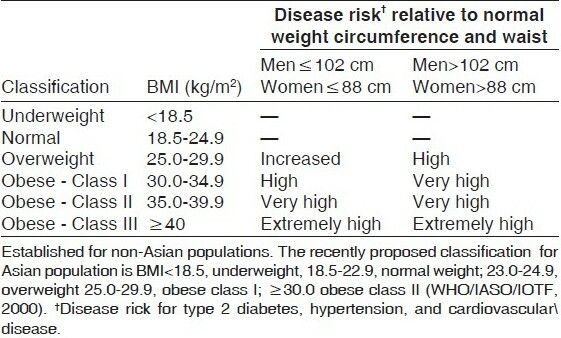 Recent large studies have indicated that measurement of waist circumference or waist-hip ratio may be a better disease risk predictor than BMI, and there is still intensive research ongoing as to whether BMI, waist circumference or both should be used to assess disease risk , [Table 1]. Several other diagnostic tools are available to assess body fat composition, such as measurement of (subcutaneous) skin fold by means of a caliper or ultrasound, bioelectrical impedance analysis (BIA), densitometry or imaging procedures (Computed tomography, Nuclear Magnetic Resonance); however, most of these procedures are not readily available in clinical practice and do not add substantial information for risk assessment in an individual, beyond BMI and waist circumference. It has been suggested that obesity is second only to smoking as the strongest risk factor for inflammatory periodontal tissue destruction. The first report on the relationship between obesity and periodontal disease appeared in 1977, when Perlstein et al. observed histopathologic changes in the periodontium in hereditary obese Zucker rats. Using ligature-induced periodontitis, they found alveolar bone resorption to be greater in obese animals compared with non-obese rats. Also, it seemed that under healthy oral conditions, obesity per se does not promote pathologic periodontal alterations; however, in response to bacterial plaque accumulation, periodontal inflammation and destruction were more severe in obese animals. Later on, the hypothesis of obesity as a risk factor for periodontal disease was supported by epidemiological studies. Adipose tissue secretes proinflammatory cytokines such as tumor necrosis factor-alpha (TNF-α) and interleukin-6 (IL-6). TNF-α and IL-6 are the main inducers of acute-phase hepatic protein production, including C-reactive protein (CRP) [Figure 1]. 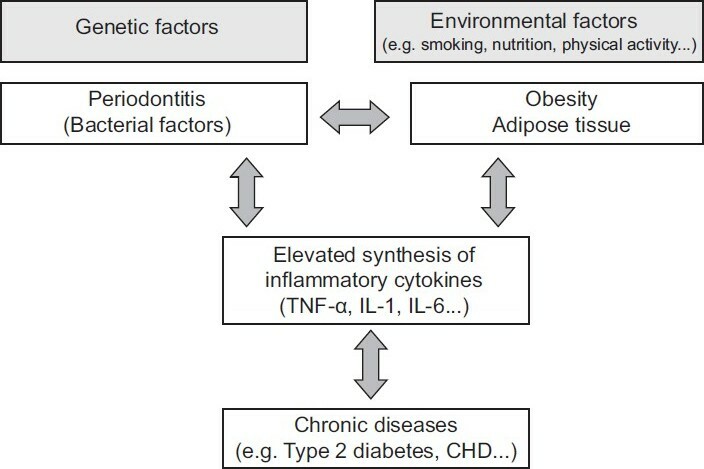 Proinflammatory cytokines may play a crucial role in the close relationship among periodontitis, obesity and chronic diseases. In fact, this association may be multidirectional [Figure 2]. For example, it has been well established that inflammation is an essential component in the development of atherosclerosis, and observational studies showed that periodontitis is associated with a moderately, but significantly, higher risk of coronary heart disease. ,, Interventional studies that examined the effects of antibiotic treatment on cardiovascular risk have generally failed to show any beneficial effect; however, these studies have mostly been of short duration (less than 1 year of treatment) and have investigated the effects on secondary prevention only. Inflammatory diseases like periodontitis induce the production of proinflammatory cytokines such as TNF-α, IL-1 and IL-6. It has been suggested that the secretion of TNF-α by adipose tissue triggered by LPS from periodontal gram-negative bacteria promotes hepatic dyslipidemia and decreases insulin. Obesity is a complex disease, and its relationship to oral status has been realized by the scientific community in recent years. Periodontists must be aware of the increasing numbers of obese persons and of the significance of obesity as a multiple-risk-factor syndrome for overall and oral health. Proinflammatory cytokines may be a multidirectional link among periodontitis, obesity and other chronic diseases. 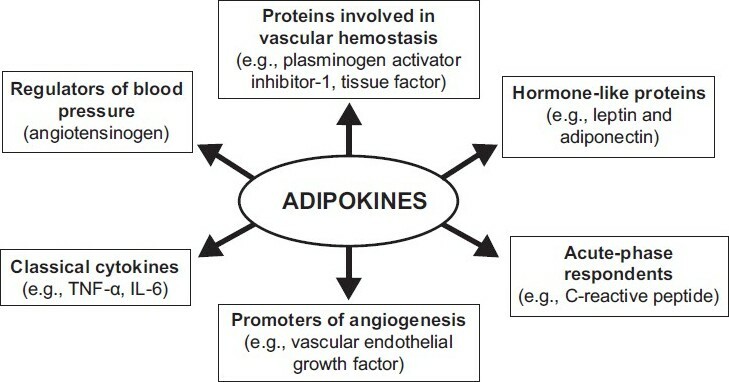 The adipose tissue is a large reservoir of biologically active mediators, such as TNF-α and other adipokines. Studies have demonstrated a close involvement of the adipokines - such as leptin, resistin and adiponectin - in inflammatory processes. However, their role in periodontal inflammation has yet to be defined. Although this relationship needs further investigation, periodontists should counsel obese persons regarding the possible oral complications of obesity, to diminish morbidity for these individuals. This includes the measurement of body mass index and waist circumference for periodontal risk assessment on a regular basis. 1. Expert Panel. Executive summary of the clinical guidelines on the identification, evaluation, and treatment of overweight and obesity in adults. Arch Intern Med 1998;158:1855-67. 9. Dalla Vecchia CF, Susin C, Rφsing CK, Oppermann RV, Albandar JM. Overweight and obesity as risk indicators for periodontitis in adults. J Periodontol 2005;76:1721-8. 10. Pouliot MC, Desprιs JP, Lemieux S, Moorjani S, Bouchard C, Tremblay A, Nadeau A, et al. Waist circumference and abdominal sagittal diameter: best simple anthropometric indexes of abdominal visceral adipose tissue accumulation and related cardiovascular risk in men and women. Am J Cardiol 1994;73:460-8. 16. Ritchie CS. 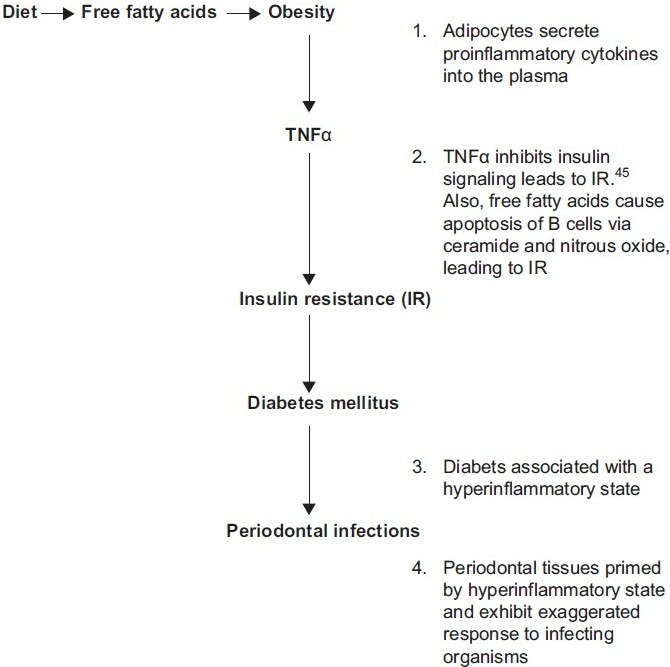 Obesity and periodontal disease. Periodontol 2007;44:154-63. 20. Willett WC, Hu FB, Colditz GA, Manson JE. Underweight, overweight, obesity, and excess deaths. JAMA 2005;294:551. 21. Nishida N, Tanaka M, Hayashi N, Nagata H, Takeshita T, Nakayama K, et al. Determination of smoking and obesity as periodontitis risks using the classification and regression tree method. J Periodontol 2005;76:923-8. 22. Kershaw EE, Flier JS. Adipose tissue as an endocrine organ. J Clin Endocrinol Metab 2004;89:2548-56. 23. Thomas T, Gori F, Khosla S, Jensen MD, Burguera B, Riggs BL. Leptin acts on human marrow stromal cells to enhance differentiation to osteoblasts and to inhibit differentiation to adipocytes. Endocrinology 1999;140:1630-8. 24. Johnson RB, Serio FG. Leptin within healthy and diseased human gingiva. J Periodontol 2001;72:1254-7. 25. Lindsay RS, Funahashi T, Hanson RL, Matsuzawa Y, Tanaka S, Tataranni PA, et al. Adiponectin and development of type 2 diabetes in the Pima Indian population. Lancet 2002;360:57-8. 26. Pischon T, Girman CJ, Hotamisligil GS, Rifai N, Hu FB, Rimm EB. Plasma adiponectin levels and risk of myocardial infarction in men. JAMA 2004;291:1730-7. 27. Pischon N, Heng N, Bernimoulin JP, Kleber BM, Willich SN, Pischon T. Obesity, inflammation, and periodontal disease. J Dent Res 2007;86;400-9. 28. Beck JD, Offenbacher S. Systemic effects of periodontitis: epidemiology of periodontal disease and cardiovascular disease. J Periodontol 2005;76:2089-100. 29. Dietrich T, Garcia RI. Associations between periodontal disease and systemic disease: evaluating the strength of the evidence. J Periodontol 2005;76:2175-84. 30. Mattila KJ, Pussinen PJ, Paju S. Dental infections and cardiovascular diseases: a review. J Periodontol 2005;76:2085-8. 31. Nishimura F, Iwamoto Y, Mineshiba J, Shimizu A, Soga Y, Murayama Y. Periodontal disease and diabetes mellitus: the role of tumor necrosis factor-alpha in a 2-way relationship. J Periodontol 2003;74:97-102. 32. Kempers KG, Foote JW, DiFlorio-Brennan T. Obesity: prevalence and considerations in oral and maxillofacial surgery. J Oral Maxillofac Surg 2000;58:137-43.